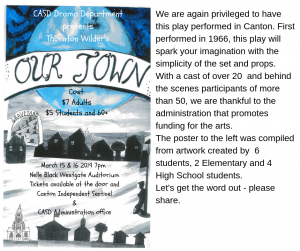 The 2018-19 CHS Drama Club will present Thornton Wilder's "Our Town"
This year, the production is scheduled for presentation on March 15 & 16, 2019 at 7:00pm in the Nelle Black Westgate Auditorium of Canton High School. Tickets are available in advance at the Canton Independent Sentinel and the CASD Administration Office. They will also be sold at the door. Students and Sr. Citizens (60+) are $5.00 and adults are $7.00.